Disclosure: This post is in collaboration with Autumn Glory apples! As always, the opinions expressed in this post are my own and I only work with brands that I purchase for my family. Thanks for supporting the brands that make the Shaw Kitchen possible! Have you ever wanted to be that person that creates the most AMAZING appetizer that has everyone talking the day after the party? Trust me when I say, I feel you. However, I also recognize that while delicious, who has the time these days to create those Tex Mex Wontons I once whipped up when I was without baby and had endless hours to spend in the kitchen. Sitting on this, I knew I had to come up with a simple swap solution to ease your appetizer woes and save you some serious time. That’s when it hit me, KEEP IT SIMPLE, LIZ! It’s amazing to me how often our brains try to complicate things. 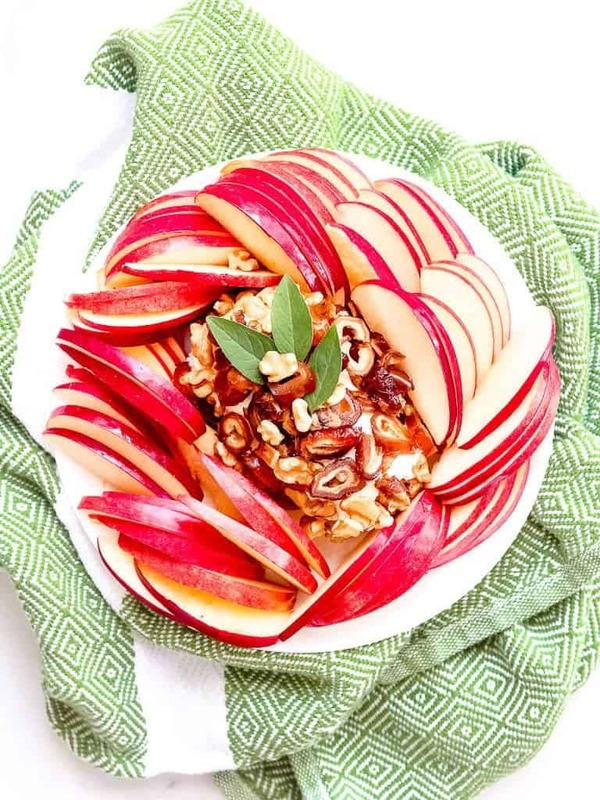 Case and point, the first rendition of this Goat Cheese, Walnut and Date Appetizer with Sliced Autumn Glory Apples took about 25 minutes to make. Yes, I decided to try to individually spread goat cheese on thinly sliced apples while strategically placing the walnut and diced date on top. Let’s just say to make that Instagram worthy was exhausting. A simple swap snack should NOT take 25 minutes to create, nope nope nope! So, back to the drawing board I went, and viola, magic happened in under 5 minutes. Yes, FIVE WHOLE MINUTES and this beauty was created! 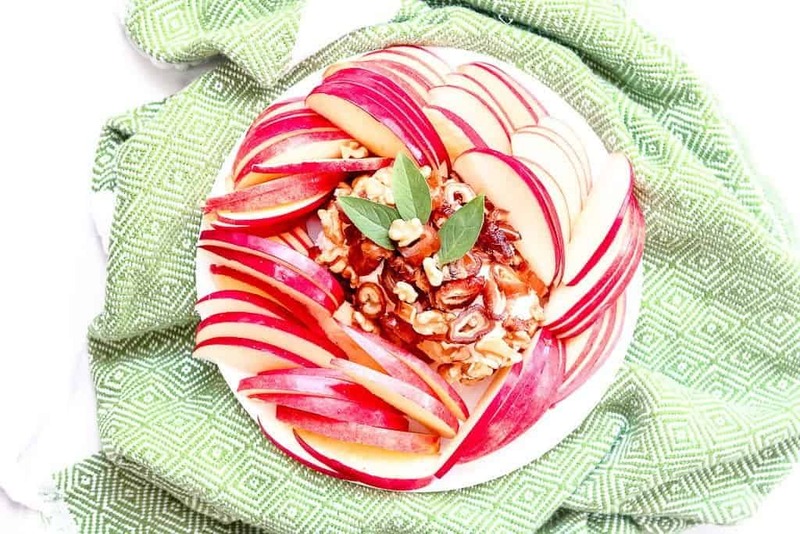 My simple swap, keep the goat cheese in log form and top with the walnuts and diced dates, layering the thinly sliced apples around the log, skin out. The beautiful colors of the skin create a wonderful red hue that pops beautifully with the goat cheese ensemble! Plus, everyone loves a little DIY creation! 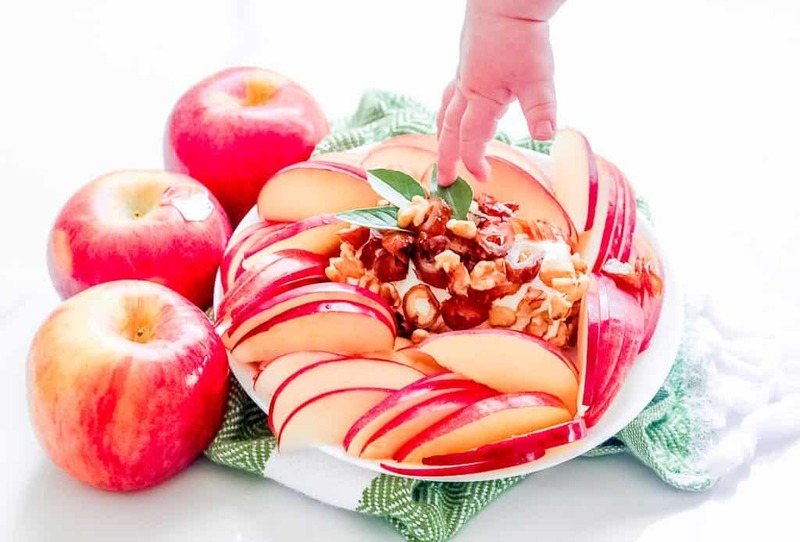 Autumn Glory apples seriously are the hero of this appetizer and they require no special ingredients or cooking methods, they are perfect just as they are! You see, Autumn Glory apples have sweet, firm flesh with hints of cinnamon and caramel. Friends have described it as tasting like a good for you candy, while Mr. CEO thinks it’s more of an apple cider in food form. Personally, I just think it’s the best thing to hit the store this season! 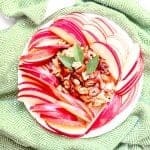 While you can certainly whip this up for a crowd, I’ve personally started making this for myself as a deliciously sweet, totally nutritious, and very simple snack to enjoy. Hayden is dying to try it too, but I have to remind those sweet baby hands she needs a few more teeth before we can snack on this together! I’m still experimenting with the gorgeous Autumn Glory apples, but word on the street is their juice creates a magical cocktail base, and mixes well with rum, whiskey, and white wine in a sangria, so rest assured, I’ll report back after Mr. CEO makes his high ball this weekend! 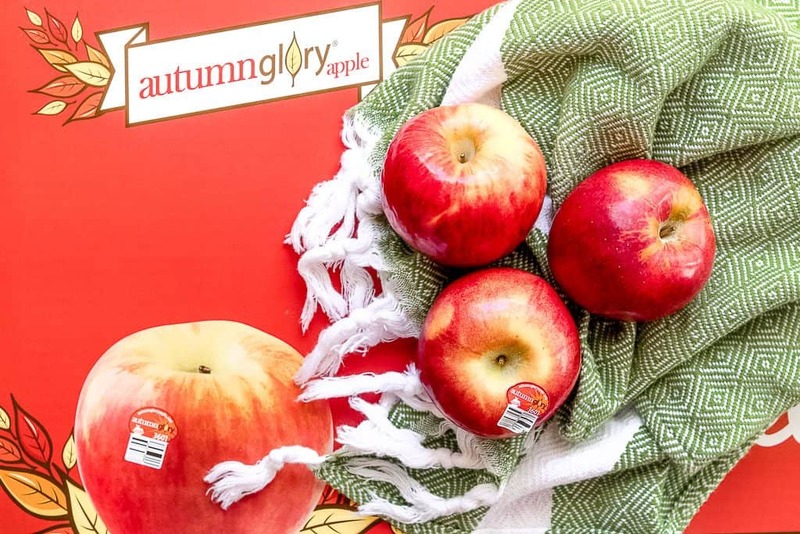 Autumn Glory apples are grown in Washington and available from November to April in stores Visit Costco, Smart & Final, Ralph’s or Food 4 Less. 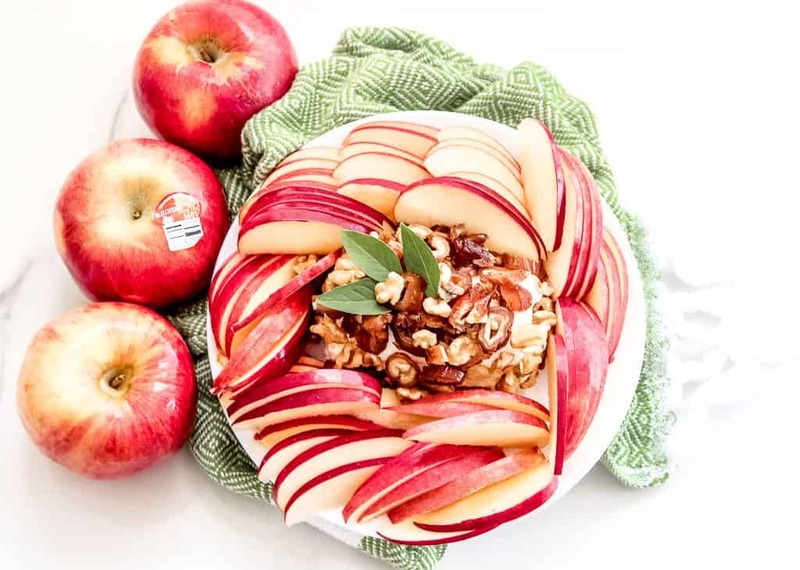 Now, without further adieu, who’s ready to be the bell of the ball with this Goat Cheese, Date and Walnut Appetizer with Autumn Glory Apples?! A simple 5 minute snack that comes together in no time! On a platter, place goat cheese log in the center. Firmly press dates and walnuts into the log. Thinly slice Autumn Glory Apples into 1/4-inch thick pieces. 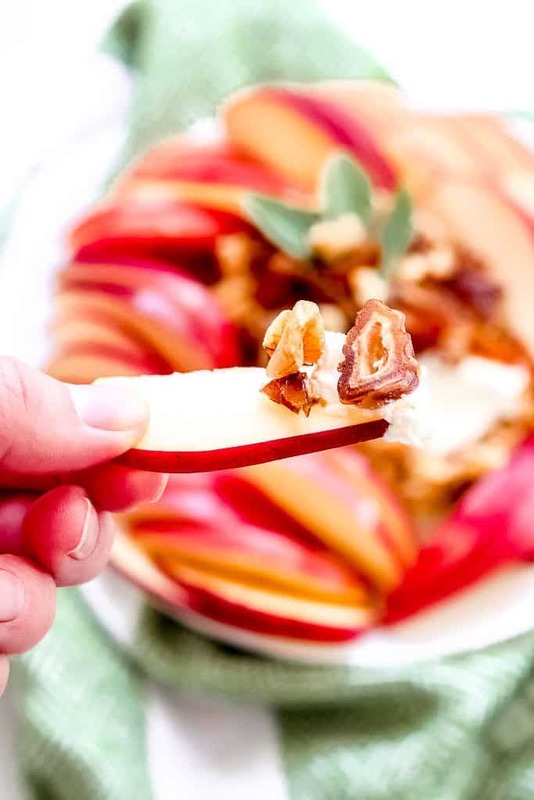 Assemble apple slices around goat cheese and garnish with sage. Serve with a cheese knife for friends to make their own bites. If you whip this up (or any other of the Shaw Kitchen recipes here), be sure to hashtag #shawkitchen #shawsimpleswaps so I can see your recipe creations! 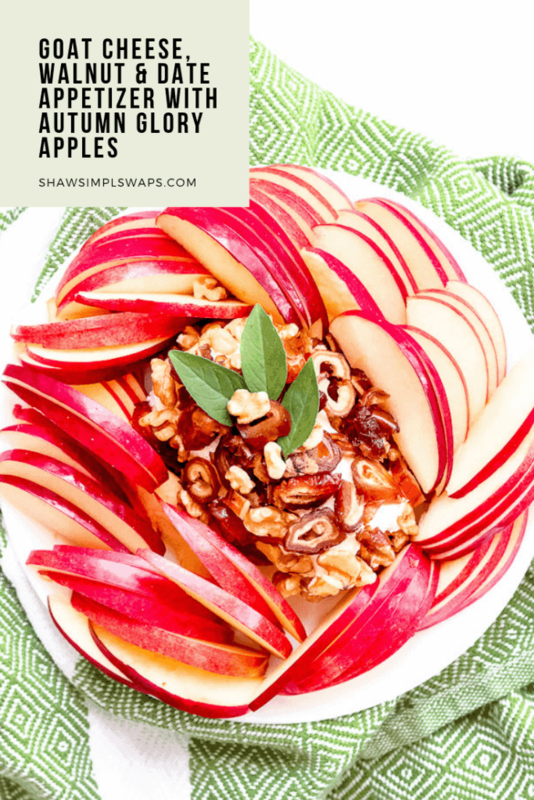 For more Shaw Kitchen tips and tricks, be sure to follow Liz on Instagram (@shawsimpleswaps), visit her on Facebook (@simpleswaps), stop by her Pinterest page (be sure to have your grocery list handy) or say hello here!